All lands, tenements, and hereditaments in Arkansas can be alienated and transferred by a deed in writing. A warranty deed can be used to transfer possession of real estate in Arkansas and offers the guarantees that the grantor holds clear title to the real state and also has the right to sell it. A warranty deed employs the words "grant, bargain, and sell," which are an express covenant to the grantee, his or her heirs, and assigns that the grantor possesses an indefeasible estate in fee simple; free from encumbrances done or suffered by the grantor, except any rents or services that are expressly reserved by the deed; and also for the quiet enjoyment thereof against the grantor, his or her heirs and assigns; and from the claim and demand of all other persons, unless limited by specific language in the deed ( 18-12-102). After-acquired title will pass to the grantee in a warranty deed and will be valid as if the legal or equitable estate had been in the grantor at the time of conveyance ( 18-12-601). As between the grantor and grantee to a warranty deed, neither the statutory nor general express covenant of warranty against encumbrances is held to cover taxes or assessments of any improvement district, whether formed under general statutes authorizing the assessment of lands for local improvements or whether the improvement district is formed by a public or private act of the General Assembly. The lien for any such local assessment or tax runs with the land and is assumed by the grantee, and the grantee is to pay any and all installments of the tax or assessment becoming due after the execution and delivery of the deed, unless otherwise provided ( 18-12-102). In Arkansas, warranty deeds and all other instruments of writing for the conveyance of real estate should be executed in the presence of two witnesses not involved in the transaction or acknowledged by the grantor in the presence of two such witnesses, who should then subscribe the deed. When the witnesses do not subscribe the warranty deed as described at the time of execution, the date of their subscribing it shall be stated with their signatures ( 18-12-104). Before a warranty deed can be accepted for recording by the county recorder, it must be duly acknowledged or proved ( 18-12-201). Any court or officer that takes a proof or acknowledgment of a warranty deed must grant a certificate of the proof or acknowledgement, which should be endorsed on the instrument ( 18-12-205). 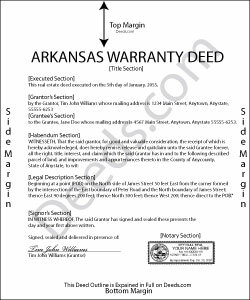 Every warranty deed affecting the title, in law or in equity, to any real property within the state of Arkansas which is or may be required by law to be acknowledged or proved and recorded will be constructive notice to all persons from the time it is recorded in the office of the county recorder in the county where the property is located. No warranty deeds will be good or valid against a subsequent purchaser of the same real estate for a valuable consideration without actual notice thereof or against any creditor of the person executing such an instrument containing a judgment or decree which by law may be a lien upon the real estate unless the deed, duly executed and acknowledged or proved as required by law, is filed for record in the office of the clerk of the county where the real estate is situated ( 14-15-404).